Trump won the presidency with 46.2 percent of the vote, less than the 47.2 percent Mitt Romney got in 2012, when he lost the presidency. Democratic nominee Ralph Northam won the 2017 election for Governor of Virginia by the unexpectedly large margin of nine percentage points, 54 to 45 percent. 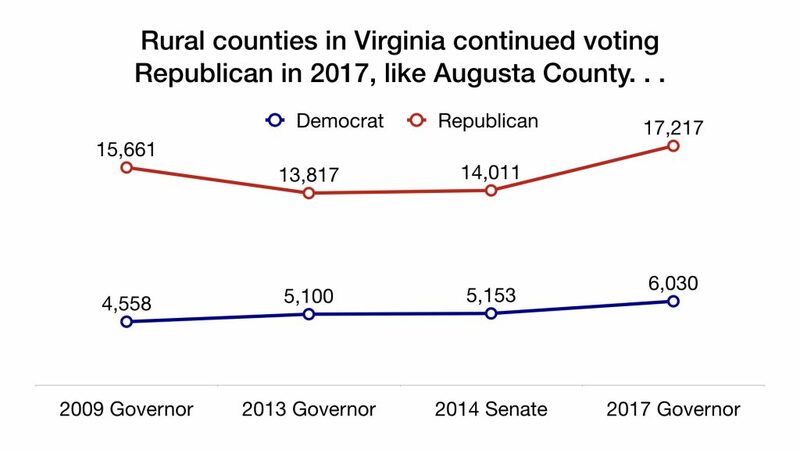 Unlike the Rustbelt states voting for President in 2016, few counties switched from Democrat to Republican since the last Virginia gubernatorial election in 2013. Instead the surprising margin was caused by presidential-level turnout in formerly-Republican suburban counties. Tens of thousands of new gubernatorial voters driven by college-educated women, millennials, and minorities supported the Democratic candidate. Six charts tell the story. Two rural counties in the Shenandoah Valley are typical of other rural counties throughout Virginia. Augusta County continued its strongly Republican voting pattern, and generated more votes for Republican Ed Gillespie than even for the victorious Republican Bob McDonnell in 2009, or for Gillespie when he ran for the U.S. Senate in 2014. The same pattern holds for Roanoke County farther south in the Valley (the City of Roanoke is not included in these numbers). 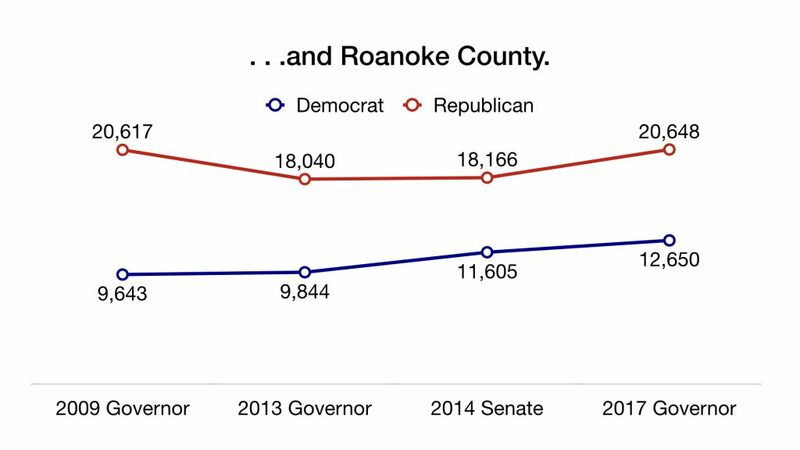 Gillespie received more votes in 2017 in Roanoke County than any Virginia Republican ever in a non-presidential election. Gillespie did not lose because of lack of Republican enthusiasm for his candidacy. Despite fears of some critics that Gillespie keeping his distance from Donald Trump would depress Republican turnout, that clearly was not the case. So why did Gillespie lose? The next three charts paint a vivid and, for Republicans, challenging picture. Fairfax County in northern Virginia is far and away the largest county in the state, home to over one million people. In years past it was a competitive but reliable Republican county. Republican Bob McDonnell won the county in 2009 by 4,466 votes. Fairfax switched to supporting the Democratic candidate Terry McAuliffe in the 2013 governor’s race by 68,065 votes. 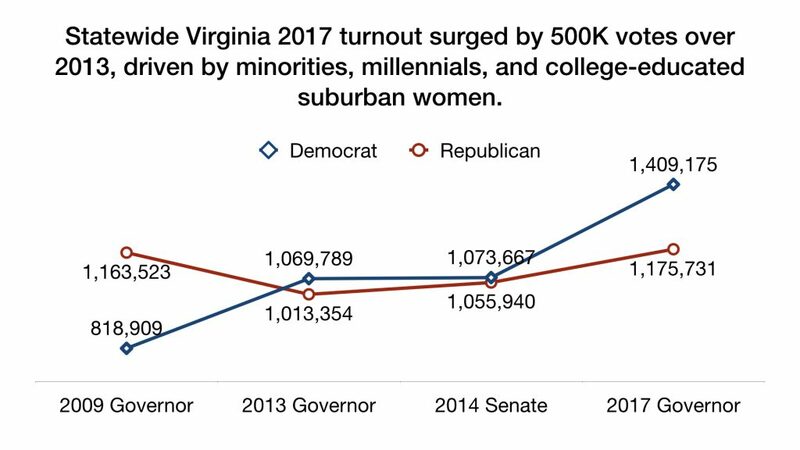 But in 2017 turnout exploded, and Northam swamped Gillespie in Fairfax County by 138,059 votes. Loudoun County, just west of Fairfax in northern Virginia, has surged in population since 2010, and is now the fastest growing county in the state. 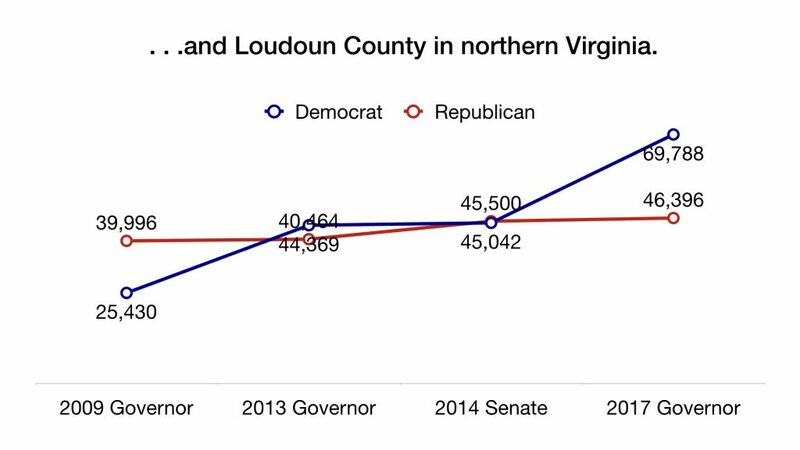 Loudoun used to be a reliably Republican county that McDonnell carried comfortably in 2009 by 14,566 votes. Gillespie won the county narrowly in 2014 in his Senate race against Mark Warner. But in 2017 Loudoun followed Fairfax with an explosion of Democratic votes. Gillespie actually won 896 more Loudoun votes in 2017 than he did in 2014, but he was crushed by the surging Democratic turnout, losing Loudoun in 2017 by 23,392 votes. 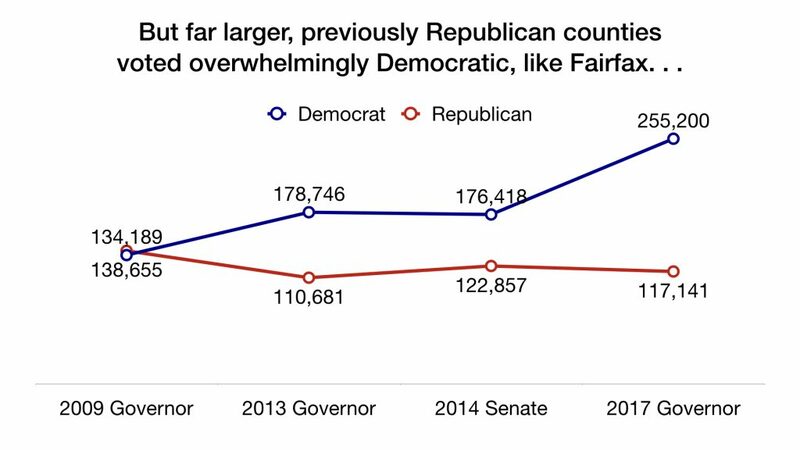 Because the counties where Democrats surged are so much larger than those that continued to vote Republican, the statewide trends reflect those of Fairfax and Loudoun. In only eight years Republicans have gone from winning the Virginia governor’s office in 2009 by 344,614 votes to losing it in 2017 by 233,444 votes. Ed Gillespie won more votes than any Republican gubernatorial candidate in Virginia history, including 12,208 more than the victorious McDonnell in 2009. Yet he was swamped by the historic Democratic turnout. Who are these voters who surged to the Virginia polls in 2017? It’s hard to imagine the bland candidacy of Ralph Northam generating this level of enthusiasm. Exit polls indicate that the surge came from voters who were trying to send a message to Donald Trump. Gillespie won overwhelmingly–56 to 41 percent–among the 47 percent of Virginia voters who said Trump was not a factor in their vote. In other words, Gillespie won by double digits among voters who were choosing between the two candidates for governor. The remaining voters used their gubernatorial ballot to send a message to Donald Trump. Twice as many–34 to 17 percent–sent a message of opposition rather than support. And among those opposing Trump, Northam won 97 percent of their votes. 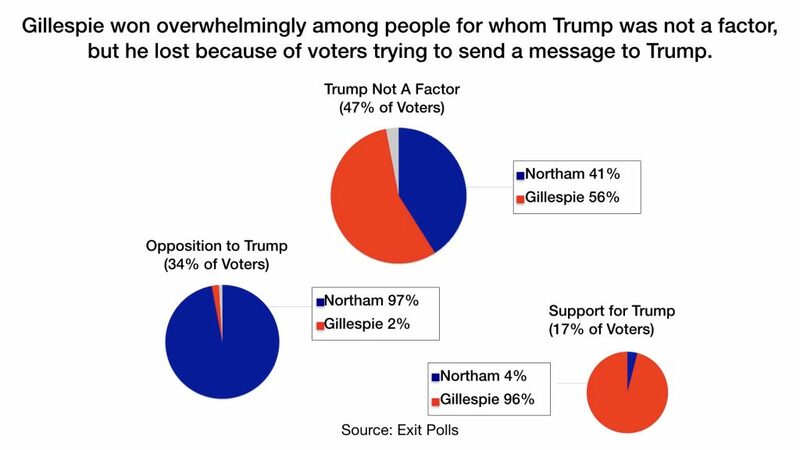 Ed Gillespie lost the governor’s race not because of his campaign, but because one-third of Virginia voters were trying to send a message of opposition to Donald Trump. What does this mean for Republican candidates in 2018? It means that every Republican candidate in 2018 will be viewed through a Trump filter. That will not be a problem in districts where Trump enjoys majority job approval. The strategy in these districts writes itself–the Republican is running to support the President, and the Democrat is running to oppose him. But viewing Republicans through a Trump filter creates a real challenge for Republicans in states and districts where a majority disapprove of the President’s job performance. In those districts, Republicans will need a relentless focus on localizing the race. Republican candidates in districts opposing Trump need to increase the proportion of the electorate that makes a decision between the two candidates on the ballot, not use their ballot to send a message to the President. Mid-year elections are almost always difficult for the party in power. The 2017 results in Virginia indicate that Republican candidates need to run particularly strong and well-funded races to withstand the headwinds they will face in many states and districts in 2018. “Obviously, the primary responsibility lies with a deeply flawed Republican candidate,” said Republican pollster Whit Ayres. That trend carries “troubling implications” for the GOP in next year’s elections, he said. Whit Ayres joined Mary Katherine Ham and Kevin Madden on their Party People podcast to discuss Republican efforts to appeal beyond the base.